How will you fare under the redesigned Amtrak Guest Rewards? 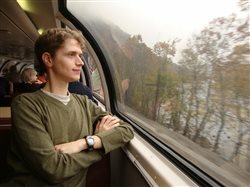 Major changes to Amtrak Guest Rewards, the railroad’s 15-year-old point-earning loyalty program for frequent travelers, announced last month and set to take effect on Jan. 24, 2016, have been met with nearly universal disappointment and derision from those already most loyal to Amtrak who are devotees of train travel, particularly of the long-distance trains. It is being seen as yet another instance of the national carrier favoring Northeast Corridor passengers over those in the rest of the country. Amtrak ticket receipts. Image by Robert Barnett. However, based on my calculations (see below), it turns out that the number of points required for a free trip will almost always be fewer under the new rubric than under the current one — with some notable exceptions. Most coach reservations will require many fewer points, and Superliner Roomette reservations (even for as long a distance as Chicago to Portland, OR) will require considerably fewer points than under the current zone system. But be prepared to dish out more points for those Bedrooms, and for lengthier one or two-zone trips — unless you book before Jan. 24, when the current system will still apply, even for travel after that date, as long as the reservation is not modified after that date. Changes or cancellations to point redemption reservations made after Jan. 24 will come with a 10% penalty if they result in points being returned to your account (the amount returned will be 10% less than the amount you initially redeemed). An additional 10% penalty (for a total of 20%) is assessed for changes or cancellations made within 24 hours of departure (or 14 days prior for sleeper reservations). The additional 10% penalty is waived only for Select Executive tier members. This is a major change from the current policy, where all changes and cancellations to redemption reservations are penalty-free. Read the full new policy here. No more blackout dates for redemption travel after Jan. 24 (though blackout dates will still apply to the redemption of upgrade and free companion coupons). Thus, the "Rule Buster" exemptions to blackout dates for top-tier members will cease to exist. The window of account inactivity beyond which one's points expire will be extended from two years to three years, and redeeming points will now count as eligible account activity in addition to earning points. The benefits of reaching the program’s elite tiers, which require earning a certain number of Tier Qualifying Points (primarily points earned from Amtrak travel), have always been more useful to Northeast riders. Unlimited club or lounge access is hardly useful when there are only a handful of lounges outside the NEC, and since upgrade and free companion coupons cannot be used for sleepers, the greatest savings from the coupons come from upgrading to First Class on the Acela Express. After Jan. 24, under the “relaunched” Amtrak Guest Rewards, those who upgrade to Business Class or ride Acela (but not sleepers) using cash will receive point bonuses. And redemption will be based on the desired itinerary’s dollar value, rather than the number of zones it traverses. This means that as fares rise closer to the time of departure, the number of points required will also rise -- whereas now, as long as space is available, you can make a last-minute redemption for the same number of points as one made well in advance. One notable upside is that the program will boast features that its heaviest users have clamored for, such as the ability to combine points with cash for ticket purchases, and the ability to make any kind of redemption reservation online (now, in part due to the intricacies of the zone system, anything but a simple, single-city-pair coach reservation — including all sleeper travel and all coupon redemptions — requires a call to an Amtrak Guest Rewards agent). A 4,000-point Northeast Zone redemption, soon to be a thing of the past. Screenshot of Amtrak.com by ThePointsGuy. The minimum redemption value for the new program will be 800 points (versus the current minimum of 1,500 points, only applicable on certain state-supported routes that generally have low fares to begin with), which will apply to all tickets whose cash value is $23.00 or less. Upwards of that amount, the number of points required will be roughly 34.5 times the dollar value, for all trains except Acela Express, for which the redemption value will be 39 times the dollar value. Under the current zone system, redemption values range from about 16 times the dollar value (for the lengthiest one-zone trips with multiple connections), to 30 times the dollar value (for the most expensive sleepers) to as high as 88 times the dollar value (for the least expensive coach tickets, particularly when the one-zone coach redemption rate of 5,500 points applies). An additional disappointment to frequent riders is the elimination of the 100 point minimum earning per paid trip. This allowed program members to amass points very quickly by taking many short, inexpensive trips. Now, all purchased trips will earn two points per dollar, with the exception of bonuses for Business Class and all Acela trips. For example, a $9.00 trip on the Capitol Corridor from Berkeley to Oakland now nets 100, so one could earn 400 Tier Qualifying Points by only spending $36 and taking two Berkeley-Oakland round-trips (the maximum on which points can be earned in a single day). After Jan. 25, a $9.00 ticket will only earn 18 points, so those four round-trips will only net 72 Tier Qualifying Points. To make up for this, Amtrak promises to introduce more ways to earn Tier Qualifying Points, including special bonuses and through purchases on the new Amtrak Guest Rewards World MasterCard from Bank of America. The new structure brings Amtrak Guest Rewards in line with the frequent flyer programs of two popular low-cost airlines, Southwest and JetBlue, which base the number of points required for a free trip purely on the ticket price. And like these airlines’ programs, it helps passengers get an inexpensive coach ticket free, but raises the hurdle for earning a free premium class trip compared to legacy airlines’ programs, where earning and redemption is based on the miles traveled rather than the price (though higher-priced tickets, particularly for First and Business Classes, generally earn more miles). In summary, it seems like the vast majority of frequent Amtrak travelers will be better off under the redesigned Amtrak Guest Rewards system, especially those who book well in advance of travel. Those who will lose out, however, are those who wait until the last minute to book (when fares, and thus the number or points required, will be higher), prefer to earn a lot of points quickly through many inexpensive trips, those who can maximize the value of their points under the current zone system (see my El Paso to Wolf Point example, all within the West Zone), and most who redeem points for Bedrooms and Viewliner Roomettes except at the very lowest fare buckets.